Oh my goodness, what a weekend! Neither of us had actually spent any time there before, but we’d had multiple friends tell us that the city is actually an under appreciated little Midwestern gem. (And, living in Kansas City, we know a thing or two about Midwestern gems.) ;) And as it turned out, we completely agreed. We loved it!! We stayed at an awesome hotel, loved wandering around various neighborhoods, visited an awesome museum, said hello to practically ever animal at the zoo, and hit the jackpot with some killer restaurants and bars around town. Like — it’s Monday morning and we’re back home now, and I still feel like I’m full from the weekend. So. Much. Good. Food. That said, now that we’re home, I’m ready for a little post-vacation detox and am craving all the salads. 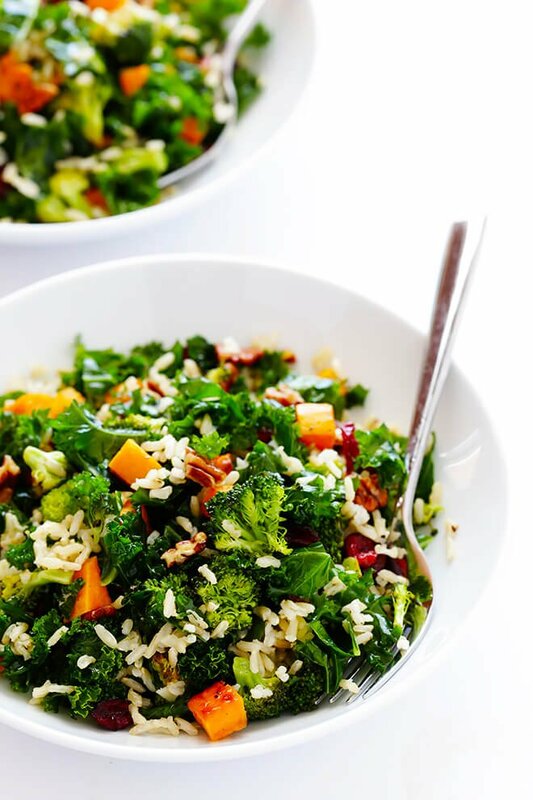 And one of the first ones I can’t wait to re-make was this delicious autumn kale salad that I tried last week. Actually, I wasn’t quite sure what to call this one. A kale salad? Brown rice bowls? 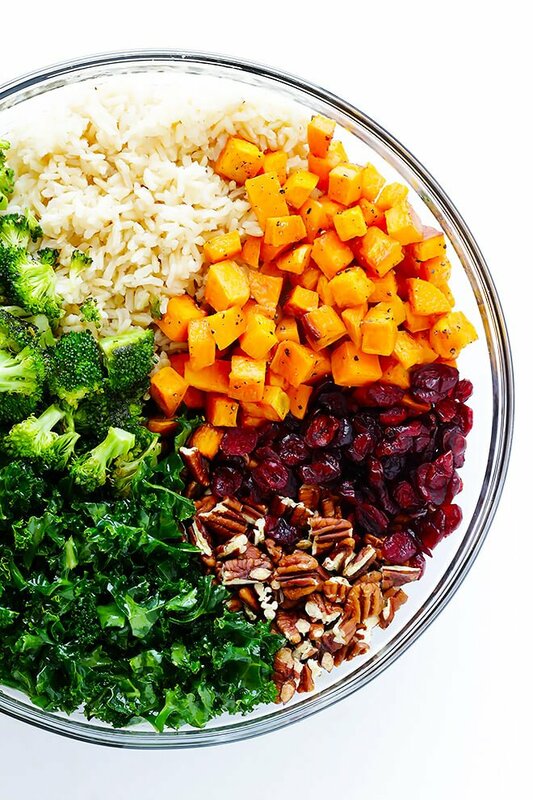 Autumn harvest bowls?!? 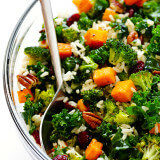 To make them, simply roast up a pan of diced sweet potatoes and broccoli. Toss those together with some kale (be sure to massage it, see below! ), cooked brown rice, nuts (I used pecans, but walnuts or pepitas or almonds would also do), and some sweet dried berries to balance out the savory. Drizzle with a simple vinaigrette, and toss to combine. And then this gorgeous salad will be yours to enjoy. 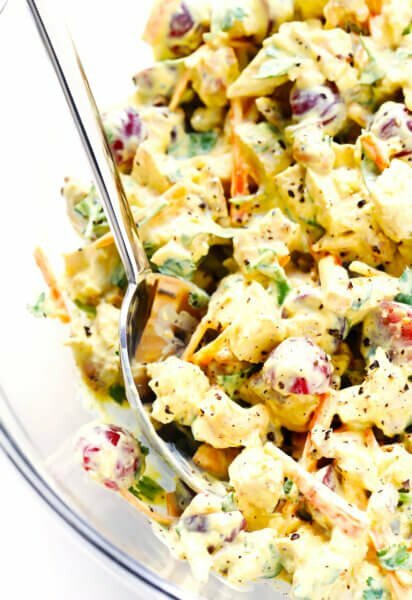 Definitely a salad you can feel good about this season, and one that I hope you try soon! Enjoy! 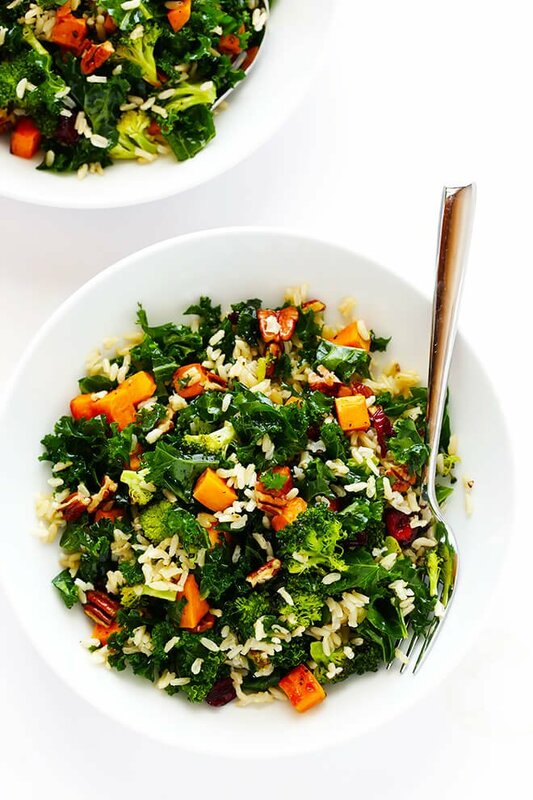 This Autumn Kale Salad with Sweet Potatoes, Broccoli and Brown Rice recipe is nice and hearty, it’s naturally vegan and gluten-free, and all of those sweet and savory autumn flavors are SO delicious together! 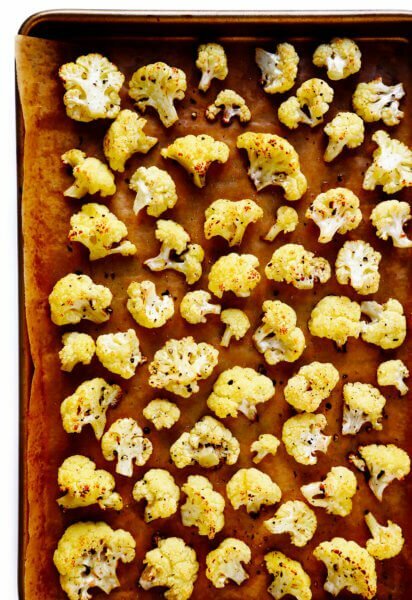 Spread the sweet potatoes out in an even layer on a large baking sheet. Bake for 15 minutes, then remove from the oven and toss the sweet potatoes for even cooking. 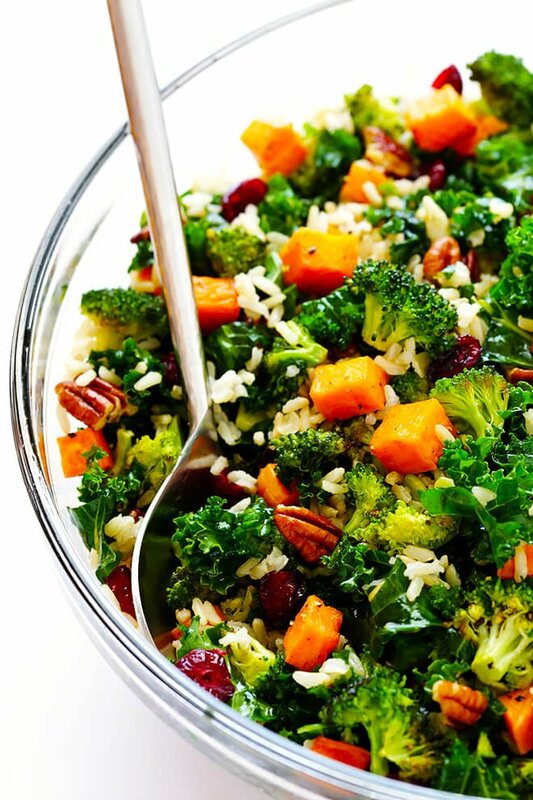 Meanwhile, as the sweet potatoes are cooking, add the broccoli to that same large mixing bowl, along with the remaining 1 tablespoon olive oil, and toss to combine. 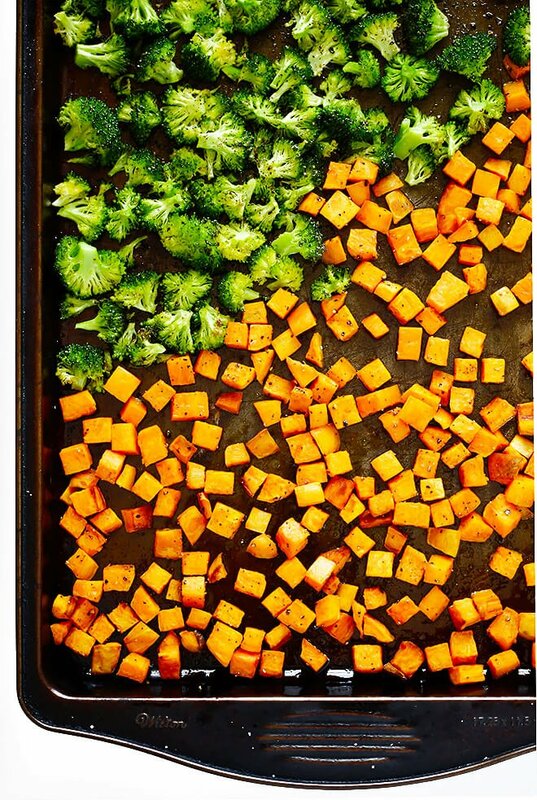 Once the sweet potatoes have been tossed, gently push them to one side of the baking sheet, and spread the broccoli out on the second half in an even layer. Bake for an additional 15 minutes, or until the sweet potatoes are soft and cooked through, and the broccoli is roasted. 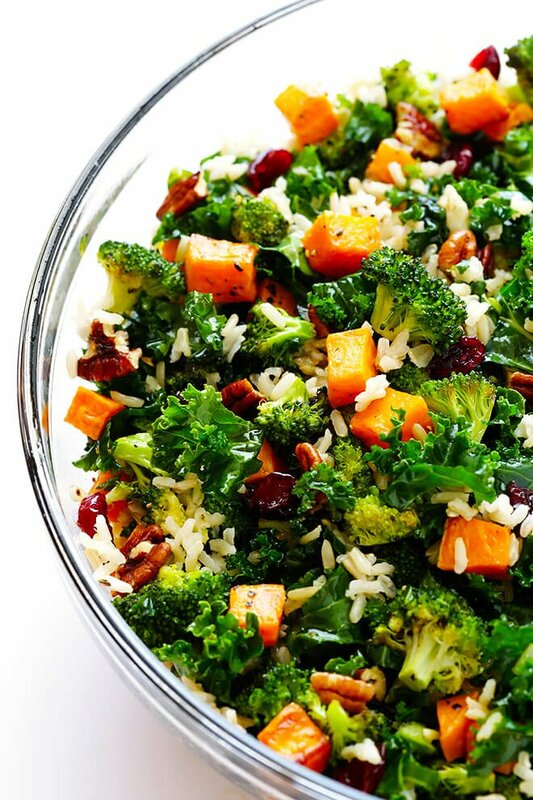 Remove from the oven, and transfer the sweet potatoes and broccoli to a large mixing bowl. Add the kale*, brown rice, cranberries, pecans, and vinaigrette (see below), and toss to combine. Serve warm, sprinkled with cheese if you’d like. Or refrigerate in a sealed container for up to 3 days. *In order to be sure that the kale is nice and soft, I recommend tossing it beforehand with 1 tablespoon of the vinaigrette, and massaging it with your fingers for 1 minute until the leaves are dark and soft. This looking delicious. All I’d need to satisfy my family is some roast chicken to go along with it. Thanks for sharing! Definitely making this for my ladies group next week. Love the pretty colors! 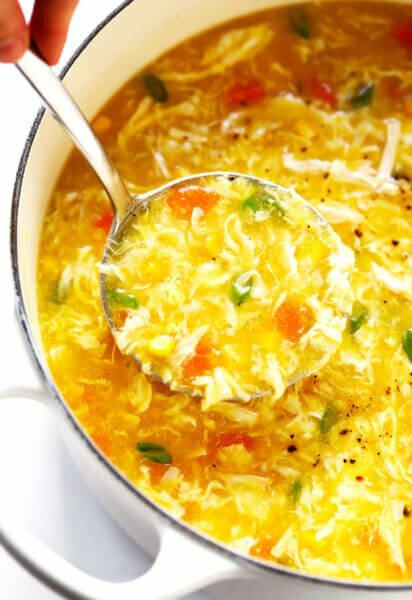 Love your recipes and this is going to be a big hit with the hubby! Can I substitute brown rice with quinoa instead? My husband was born and raised in Omaha and I spent the 2nd half of my twenties there until we moved to Kansas City after we got married. I will have to say I MISS Omaha. We are in the Ozarks now so trips up there don’t happen very much anymore. There was always a new restaurant or bar to try but our favorites are the old school South Omaha places that have been around forever…oh and of course the zoo is amazing minus the giant snakes. So excited to hear where you went! I’m a major fan of Midwestern road trips… I haven’t been to Omaha yet but I went to Des Moines last month and was blown away. There’s so many underrated cities in America and I want to visit all of them (shameless plug: visit my little town of Tulsa!!). This was delicious! I substituted quinoa for the rice and roasted up some pumpkin seeds with the pecans for an extra treat. Topped it off with feta cheese and its officially made it to the “favs” list! The colors are beautiful – and its very filling.Thanks for sharing this delightful salad. I can’t wait to try this recipe! We harvested so much butternut squash from the garden this year and it’s piled up in the house. Do you think it would substitute well for the sweet potatoes? Thanks, Alisha — we hope you can try it soon! This is AMAZING!!!! I cannot wait to try it! Thanks, Kara — we hope you enjoy it! the colors make your salad so fresh and tasty!!!! Love your recipe! Thank you, Sabrina — we hope you can give this a try sometime! Hi! It looks delicious and stunning. What an amazing serving of salad! I love fresh food with vegetables and providing vitamins to keep healthy as always. Thanks for your sharing. Such a great dish! My husband later admitted he thought it wont work out but “at least it will be healthy”. But he really loved it and I will make it again soon. Amazingly tasting salad and although I am a cheese fan no cheese required! Thanks! Really never seen before like the salad, It’s inspired me to make because we are always making from tomato, carrot, onion with Cucumbers. Thanks! Yum! Thank you for this amazing recipe. It looks so delicious. I’m definitely going to try this. You’re very welcome, Edna — we hope you enjoy it!